TEPETITÁN, El Salvador, Oct 4 2017 (IPS) - Filling a jug with water to supply her household needs used to be an ordeal for Salvadoran villager Corina Canjura, because it meant walking several kilometers to the river, which took up a great deal of time, or else paying for water. The initiative, launched in February 2017, is being promoted by the Global Water Partnership (GWP), which, together with Australian aid and the Ford Foundation, have provided funds to get it going, while local organisations and governments have given operational support. The system´s technology was developed by the consortium Mexichem Amanco, which entered into the market of polyethylene membranes used as waterproof barriers in civil engineering works, sanitary landfills, and artificial lagoons for aquaculture, among other uses. In 2013, GWP Central America had already promoted a water harvesting project in southern Honduras in communities suffering from drought, and this project is being replicated in El Salvador’s Jiboa Valley. In this small country of 6.4 million people, eight rainwater harvesting systems have been installed so far in seven municipalities in the Jiboa valley in San Vicente. There is one in each municipality, except for Jerusalen, located in the department of La Paz, where two systems have been installed. Of the 323 families identified as having problems of access to water in rural communities in these municipalities, 100 are benefiting directly from the project, conceived of as a pilot plan that would offer lessons for its expansion to other areas. Participation by local women has been vital to the implementation of the project, taking advantage of the fact that they already have a strong presence in the communities through the Network of Women Entrepreneurs of the Jiboa Valley. “We are the ones who do the housework and have to go looking for water… we are the ones who worry and suffer to find it for our families,” said 43-year-old Lorena Ramirez. Ramirez shared her experience with IPS during a meeting on the country’s water situation, held on Sept. 21 in San Vicente, the capital of the department. She is originally from Hacienda Nuevo Oriente, a village of 400 people, located in the jurisdiction of Verapaz, also in the department of San Vicente. There, another 15 families are benefiting from the harvesting of rainwater. Ramírez, a homemaker who has a kitchen garden, added that, before the arrival of the project, the families of the village had to look for water in the ravines to wash clothes and for other necessities. The water they used to drink was fetched from a spring located a kilometer away, but they had to get up very early, otherwise it would be empty. “We drank from that spring,” she said. During the May to October rainy season there is no problem keeping the polyethylene bag full, Ramirez said. But during the dry season, they will have to establish a mechanism for using the resource wisely. 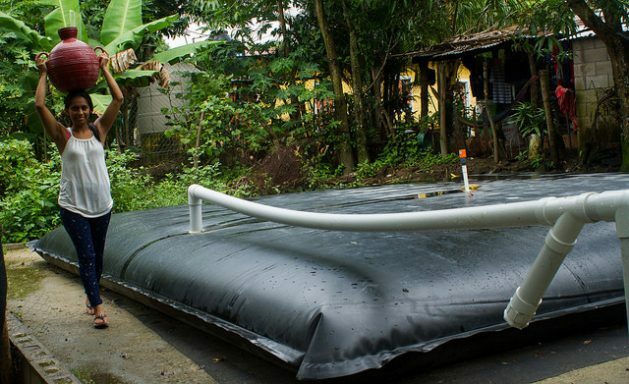 It is estimated that the 25,000 liters stored in the bag are equivalent to five tanker trucks, and can supply a family for 15 days to one month, depending on the use, although each system installed in El Salvador is intended for 15 families. “We can’t say this completely meets the needs of those 15 families; this is for filling a couple of jugs for drinking water and to use for basic things,” she stressed. And when the water runs out in the summer, the participating municipalities have committed to sending tanker trucks and keep the bags filled, so there will always be water. The basic idea is that the harvested water is exclusively for drinking, so the families involved in the program have received a filter to make it potable. The University of El Salvador will provide equipment and scientific personnel to measure the quality of the water that has been purified, said Marta Alfaro, mayor of Jerusalen, one of the municipalities participating in the programme. One of these systems is currently being installed in the Jerusalen neighborhood of El Progreso, and another in the village of Veracruz. “We want to keep installing more systems, it’s not so costly, but the thing is that this year it was not included in the budget,” Alfaro told IPS. For the next year her administration will include in the budget the installation of 10 systems in 10 other communities. Each system costs around 1,400 dollars, Vilma Chanta, a researcher in territorial development for the non-governmental National Development Foundation, told IPS. The plan to harvest rainwater is “a short-term solution for rural communities, instead of installing water pipes connected to the national grid or other mechanisms, which would be for the medium and long term,” added Chanta, who is also a volunteer at the Water Youth Network, an independent space promoted by GWP Central America. And with the already visible climate change effects, this effort “has the potential to be an alternative for the adaptation to climate change impacts,” she said. Jorge García, of the Ministry of the Environment and Natural Resources’ Water Fund, told IPS that one of the main goals of the water plan is to store water in large reservoirs, to address the problem of scarcity. The plan would cost about 1.2 billion dollars, he said. “This pilot project in the Jiboa Valley will set a precedent that can be replicated,” he said. And while the water collected is primarily for drinking, Lorena Ramírez, from Hacienda Nueva Oriente, said that because in the rainy season the bag fills up quickly and must be drained, she plans to capture that surplus in a small well and use it in her garden. “That way I use it to cover our main needs and irrigate my milpa (traditional corn crop) and my crops of beans, tomatoes and green beans, and without affecting the other 14 families,” she concluded.